Hello Autumn…Hello Leopard Print Jacket! 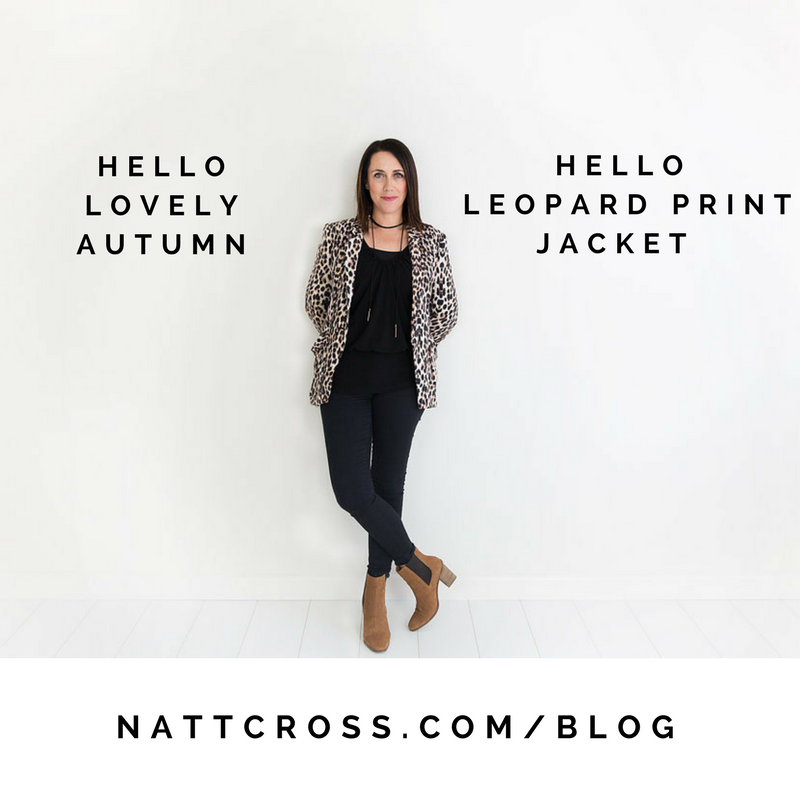 Hello Autumn & Hello Leopard Print Jacket! As I write this blog I have just realised it is actually my first for 2018! I am really not sure where January & February went? Between the haze of New Years, summer holidays & kids going back to school, it seems the days have continued to roll on and just like that it is now March! Autumn is my favourite season. I look forward to autumn like my kids look forward to an ice cream after school at our local ice creamery. You see the arrival of autumn signals a change in season, a change in pace, a change in food and thankfully a change in fashion. Sure I love watching the trees change colour. The hues of burnt orange, red & yellow are of course stunning. I enjoy the cooler mornings and evenings while still enjoying glorious warm sunny days. My birthday is in autumn as are the birthdays of 2 of my kids which means there is a guarantee of cake and presents in autumn. But the main reason I get so excited with the arrival is – drum roll please… it means it is time to break out my leopard print jacket! WHAT? At this point it is possible you are slightly confused by my enthusiasm toward autumn being centred on my leopard print jacket. I don’t blame you if you are rolling your eyes either! You see I love Leopard print – love it love it love it! I am giddy with excitement at the prospect of wearing my favourite jacket this weekend when I go to Melbourne for a styling conference. I feel like a million bucks when I wear this jacket. I seem to stand a bit taller and I always feel like I can take on the world when I wearing it. The funny thing about this jacket is that I found it – on a clearance rack 6 or 7 years ago for the grand price of wait for it…$10. I have worn it that many times and for every possible occasion. I actually had my professional photos taken in said jacket –it is part of my style signature! Ok, so what is the point of me sharing this?? Nothing…except that you need to have things in your life that you look forward to. Are you walking through life just going through the motions or are you looking forward to the change of season with a positive expectation. Sure a leopard print jacket is not a life changing thing – but gee I look forward to wearing it! Again – what are you looking forward to? If the answer to this is – nothing, then I am confidently challenging you right now to change that. Go out and find something to look forward to. The season has changed, so why not make a positive change with it. Change the way you dress, change the way you eat, change your house around, change your hair, and perhaps even change your attitude. Go on – embrace the new season and go find yourself something to look forward to. Who knows, you may even find yourself a leopard print jacket on a clearance rack too! Change is always wanted. We all need to renew the mind, body, soul Natt.